Venice is known for its twists and turns, its bridges and palaces, but not for its beautiful and hidden gardens. Which is a pity, by the way. With all those high walls on both sides of each Venetian streets, imagining that behind them there could be a garden, it’s not so obvious. A lot of Venetian palaces have their garden, but if you don’t step in, you won’t know it. What are the hidden gardens in Venice you can’t miss? Here’s our personal list. Inside this ancient Venetian palace, known for being home to the Querini Stampalia Foundation, there’s a garden. On the contrary of what you might think, this garden (as it is today) is quite recent. 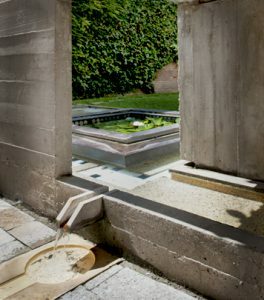 In fact, in 1949, the architect Carlo Scarpa was chosen to renovate and redesign the garden, that had become a storage during the 80s it. Among the list of the museum you must see once in Venice, we mentioned the Peggy Guggenheim collection, not only for the gallery itself but also for the beautiful garden, the palace hides inside its walls. During summer, this hidden garden in Venice becomes a place where to drink a good Spritz in company with Art. Even the island that every day wakes up with a splendid view of St. Mark’s Square has a hidden garden. With a labyrinth too. If you want to know more about the island, how to get there and how to visit it, here’s you find all the information you may need. This palace is located in Cannaregio, not far from our hotel, near the church of Madonna dell’Orto. Unlike several palaces in Venice, Palazzo Contarini Dal Zaffo’s facade has no symmetry. Inside this beautiful and fully frescoed palace, there’s a secret and huge garden. Unfortunately, you won’t see the garden as in the famous painting of Francesco Guardi, but it still astonishing. Could you imagine a place with a giant garden in Venice? And when we say “giant” we meant it. Ca’ Zenobio is the place where you can find the most incredible hidden garden in Venice. Ca’ Zenobio palace is located in Dorsoduro district and is owned by the Armenian Community of Venice. We have to say that is not always open for a visit, but you can stop by and see if there’s any Biennale collateral event hosted.